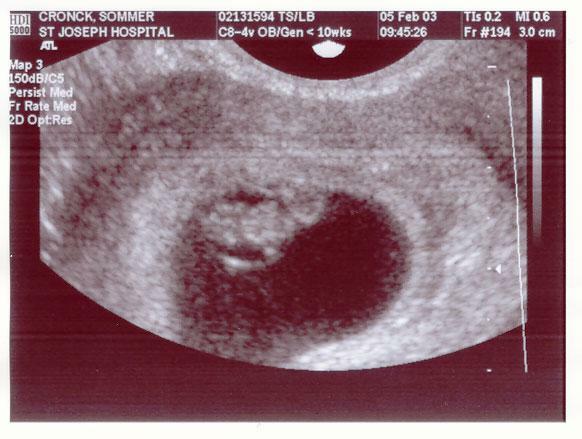 We had our first ultrasound today… it was so neat to see the baby. (S)he measured about 7 weeks, and I feel we are 7 weeks and 1 day today, so that was right on track. We also got to see the heart beating, it was amazing! Baby’s heart rate is 136. We’ve got a photo below of the picture. The first one is un-altered, and I kind of marked it out on the second one for those less skilled in ultrasound reading. So it looks like all is well with Baby! Mom could use a little help, though… the morning sickness is constant: morning, noon and night. I got a prescription today to hopefully help alleviate some of that, and get some food back into me. Our next midwife appointment is February 14th, 2003 at 4:15 p.m. (PST) ~ we’ll post an update afterwards. Prev We’re having a baby!